In general people assume I’m a gamer, because of Warcraft. By that I mean, people that don’t know me very well. Sure thing, I play various games on our monthly game nights (we hold them with a small and variying group of friends)., but the amount of video games I’ve played is small. Sure, I had days where I would try various ones, but in general it was never much. There’s a few games I did play a lot and one of them, though the word ‘franchise’ might be better, has always had a special place in my heart. I played video games since I had acces to a Commodore 64 and quickly had a love for the good old RPGs and such, but there was hardly any of that. It took some time for me to get to that. I also played on a Super Nintendo and a Game Boy, so Lufia and Zelda are no strangers to me. It was the game I played at a friend one day though, that captured me. I was allowed to pick a game from the list and chose the one with the resounding name ‘Warcraft’. We played for hours, not realizing our mission we started building an enormous expansive conglomoration of buildings over a couple of days. Suddenly other creatures started marching into the screen, which were Orcs. We fought the bravely with our confused mayhem of wizards, clerics and foot soldiers and victory was ours… if we ever figured out about that bridge we had to cross to get to the enemy. 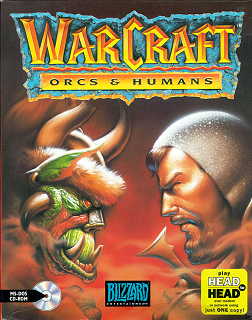 Now, back in that time there was so much on the market when it came to games, so I never got my hands on Warcraft: Orcs & Humans. I only played it at the friends house, but I loved that game. I loved the Tolkienesque setting of humans and elves fighting Orcs (not sure about the elves, but for sake of argument). The game play felt innovative, new and challenging and I was captivated by this game. The cinematics where impressive, there was a guy speaking about epic warfare between Orcs & Humans. I mean, there were cinematics! What was also really cool is the general atmosphere of seeing a map, a war room with two people on a table and hearing a story every quest. It totally added to the experience, which was quite new. Granted, if you look at videos of the game now on youtube it will be hard to imagine how captivated we were by it. I had been reading Tolkien already and it made a major impact on me, so this game was exactly there at the right moment. It took some time for it to re-emerge and become the game we played forever. More in a following chapter about my favorite game.